My husband and I started camping six years ago and decided we needed to camp at Peninsula State Park in Door County, Wisconsin at least once. We have now camped there seven times and are already making plans for our next trip to the park. It is definitely our favorite camping destination. Where is it? If you look at a map of Wisconsin and look at the thumb-like piece of land on the right hand-side of that state that's jutting out into Lake Michigan, you are looking at Door County. It's a 75 mile long peninsula that attracts hundreds of thousands of visitors a year. 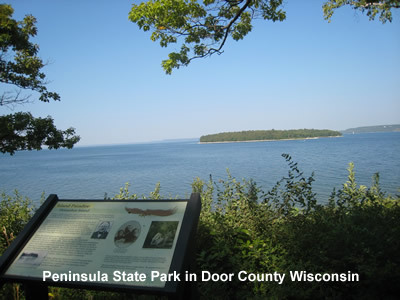 Peninsula State Park is located in Fish Creek, Wisconsin which is about 55 miles up into the peninsula. The entire area is beautiful and picturesque. 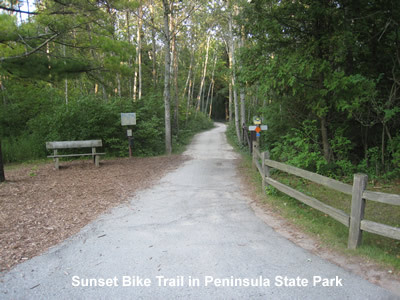 But in my mind, the best place in Door County is Peninsula State Park. In addition the park owns Horseshoe Island, one of several islands adjacent to the park (the others are privately owned). It is accessible by boat, canoe, or kayak and is available for day use only. No overnight camping is allowed. Wildlife is plentiful in the park. We always see lots of deer, birds, and squirrels (plenty of raccoons too but they're not welcome visitors since all they want to do is steal food from coolers and off picnic tables). 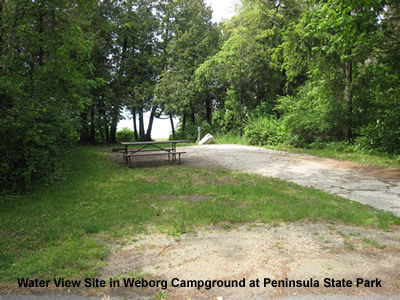 In my opinion the best campsites inside the campground are at Weborg campground. It's small; there's only 12 sites, all of which have electric. Camp hosts from other campgrounds in the park jokingly call Weborg the "Taj Mahal" of the park because it's quiet and secluded which means there's little traffic; the sites themselves are roomy; the bathroom is close to all the campsites; there's a fishing pier just a few steps away where gorgeous sunsets can be watched (yeah, you can fish there too but make sure to buy a fishing license first); and several of the sites are right on the water. 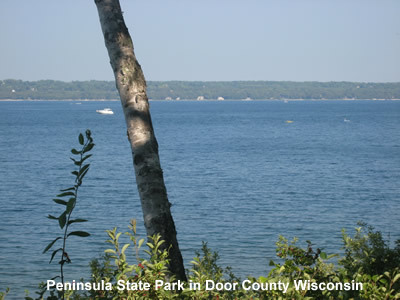 The area surrounding the park is like the frosting on the cake because, if it's rainy or you just want something else to do, there's plenty of options from wine tasting at local wineries, a ferry ride to Washington Island, browsing the art galleries, taking a trolley ride, picking cherries at an orchard, going to a festival, taking a sailboat ride, taking a Segway tour (check the Top Board review on the equipment), or renting a moped at the edge of Peninsula Park to ride around the park or into town (lots of good places to eat too). Fall is (again, my own personal opinion) the best time to camp at Peninsula State Park. The colors on the trees are gorgeous, the air is fresh and crisp, the temperature is perfect for hiking and biking, and the autumn produce at the farm markets is amazing (buy a few Honeycrisp apples). The color is typically at its peak the first or second week of October. 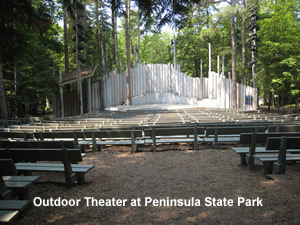 Because Peninsula is Wisconsin's most popular state campground, advance reservations are highly recommended. The park accepts reservations up to 11 months in advance and are made through the Reserve America reservation system. Per night fees vary depending on whether or not the site has electric hookups, a view of the water, and if it's prime camping time (Memorial Day through Labor Day along with Friday and Saturday nights during September and October) and range from $13 to a little over $20 per night - still a very reasonable nightly fee. **Note that the dates the campgrounds the open and close are subject to change. Canoe, kayak, bike (single, tandem, and tagalong) rentals are available seasonally (and are also weather dependent) and there is a campground store that's also open seasonally. Interdenominational services are held at the park amphitheater Sunday mornings during the summer. 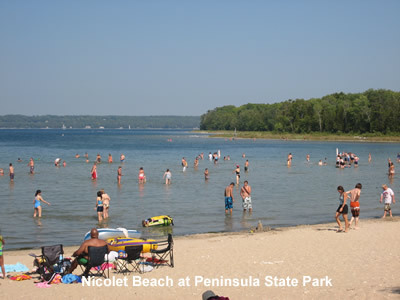 Additionally, WIFI access is available seasonally at Nicolet Beach and firewood is available for purchase daily inside the park as well as at several locations near the park (note that firewood cannot be transported more than 50 miles from the park). For information on the surrounding area, click here.